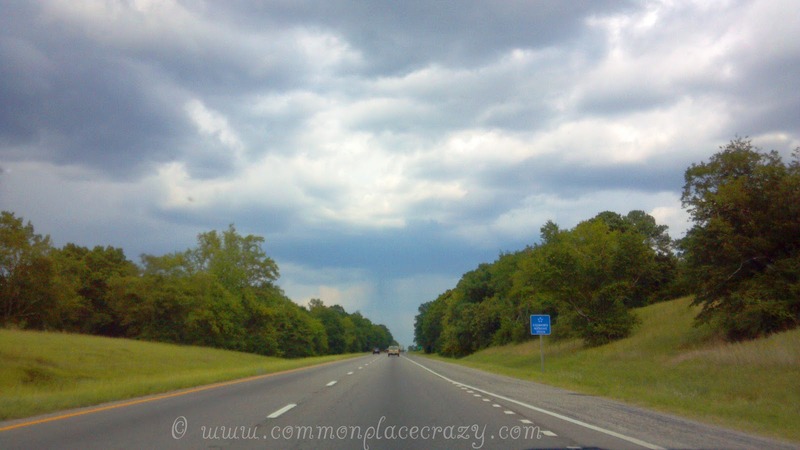 Commonplace Crazy: We're Just Like Bonnie and Clyde! As my thousands...hundreds...tens of readers know, we were recently on a vacation road trip. We left California, drove all the way to Atlanta, GA, and returned home by way of Missouri. You can see the highly accurate map on a previous post. What I haven't mentioned was our run-in with the law in the Deep South. Imagine this. We're driving along in broad daylight through Mississippi. In a 2002 Pontiac Grand Prix. A junior high school teacher and a hillbilly who frequently speaks at church. In the back seat we've got a cooler full of ... Pepsi and bottled water. The Hillbilly is driving amazingly close to the speed limit. Well, pretty close. The road looked something like this. Or it could have been this road. I forget. Suddenly he says, "Well, what is he after me for?" Yes, folks we've been caught. There's a highway patrol officer pulling us over. So we're sitting there gathering things like his driver's license and the registration when the Nice Young Patrolman comes to my window and begins speaking in a lovely Mississippi accent. "The reason I pulled y'all over is that yer license plate frame is covering the state name on yer license plate, and I couldn't tell where y'all were from." The Nice Young Patrolman then proceeds to examine our documents, looks at The Hillbilly and says, "Well, if you'll just come back to my car with me, we can get y'all checked out. If everything is okay, I can just let you go with a warning." Yes, friends. The Nice Young Patrolman is going to check us out to make sure we're not wanted felons. In a 2002 Grand Prix. With a TJHS license plate frame covering the word California. And blatantly drinking from a can of Pepsi and a bottle of water. We're just like Bonnie and Clyde!! So The Hillbilly and The Nice Young Patrolman wander on back to the patrol car, leaving me sitting along the freeway. It is approximately 215 degrees and 99% humidity. So I did what any of you would have done; I turned to Facebook. (Facebook must have changed my status update because it says "93 degrees and 56% humidity." That can't be right.) I told my friends our plight. LK: Yikes! Because y'all definitely fit the profile of drug runners. Come to Ohio, Cynthia...we'll treat you nice! CNR: Wow! Why? Did he find out about The Hillbilly? Cynthia Meents: Ohio is sounding good about now! Now, CNR, HOW would he find out about The Hillbilly? Have you been making phone calls? Eventually, the Nice Young Patrolman comes back, leaving The Hillbilly standing in front of the patrol car. He informs me that he's just going to check the VIN on the dashboard against the number on the registration. Now I am here to tell you that I have been pulled over my fair share of times (plus or minus), and I have never had an officer do that! But, looking like Bonnie and Clyde and all, we are apparently in need of this particular procedure. So the Nice Young Patrolman checks the VIN on the window, then opens the driver's door and checks there too. As he's checking he's asking questions: "Where y'all headed? Where ya from? Going to see yer granddaughter? How old is she? Are you going straight home from there?" And I (possibly based on my extensive criminal record) know that he has already gotten all of these answers from The Hillbilly. Thank goodness we had our story straight. He had to let us go. And that, y'all, is the story of how The Hillbilly and I were nearly sent to do hard time in the Deep South ... for having an inconveniently placed license plate frame. What do you think? Should we have made a break for it? I'm linking up with the very funny writers at Finding the Funny! and the excellent writers over at Yeah Write! Labels: Life's Little Absurdities, Life's little irritations, My Hillbilly, Nothing a lot of chocolate won't fix, Why do I get myself into these things? I've Been Driven to Cartooning!